Hot sauce is quickly becoming one of America's favorite condiments. In fact, its popularity has grown 150% since 2000. This means there's more demand than ever for the best hot sauce. Beyond big brands like Tabasco and Cholula there are thousands of small businesses making delicious sauces for grocery stores, farmers' markets and novelty gift shops. Because there is so much competition among these small brands, the label is often the deciding factor in the purchasing process. Bright colors, eye-catching graphics and memorable names often distinguish what would be considered a collectible as a opposed to run of the mill brand name sauces. Whimsical descriptions, parody names, even bottle design or add-on gimmicks provide that little extra to make one product stand out from the other. Like wines and craft beers, sometimes the visual appeal of the label and bottle sell the product, not just what's inside. So when your hot sauce bottle is viewed as a piece of art in a sea of bland packaging, the consumer's eye will be drawn in. Don't forget that the type of material matters too! Keep in mind where and how your product will be used. Dripping sauce and sticky fingers are common problems your label will need to withstand. To protect the artwork and quality, make sure you use a laminate over the paper label or even select a film label. 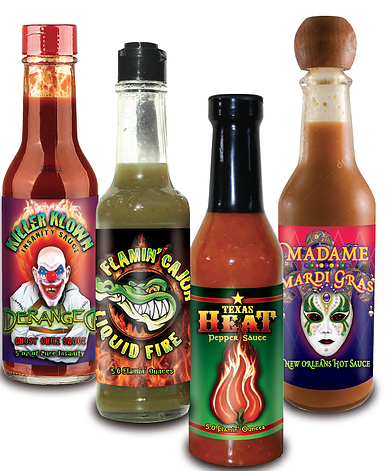 And with the HP Indigo Digital press you can have your entire line of sauce labels printed at low order minimums. This will give you the flexibility to experiment with new blends or even create special event or limited time offers without breaking the bank. See our sauces page for more tips or contact an expert below.